With just hours left until the first midterm elections results are released, banks are rushing to get their last-minute previews in, with Goldman the latest to opine that the contest for control of the House majority looks fairly competitive, and repeating what everyone by now knows: Democrats appear more likely to win the majority than the Republicans are to hold it. 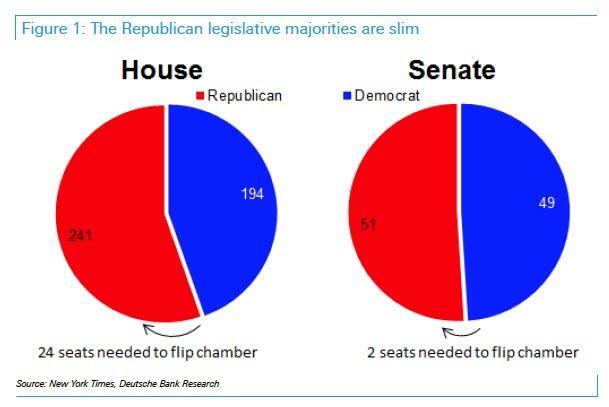 Meanwhile, in the Senate the picture is flipped, as Democrats have a very narrow path to a majority but Republicans appear much more likely at this point to maintain control. 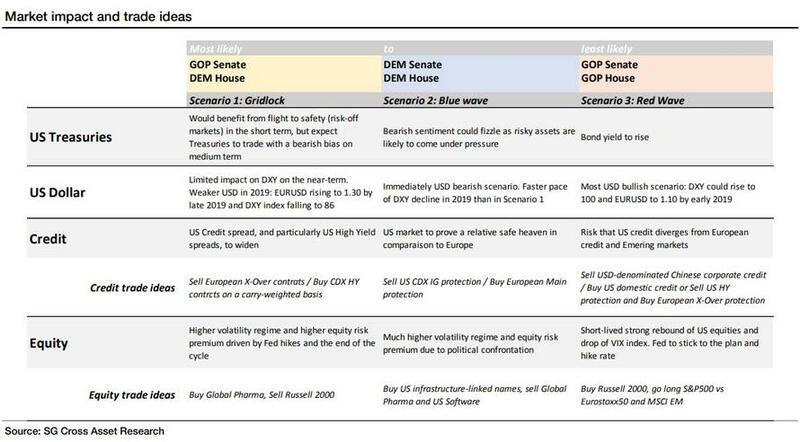 So for anyone still looking for a last minute pre-election status check and missed our "complete midterm elections guide", here is what Goldman's clients are reading right now, courtesy of the bank's political economic Alec Phillips. On November 6, all 435 members of the House and 35 Senate seats will be up for election. In addition, gubernatorial elections will be held in 36 states. Generic ballot: The final generic ballot polling is averaging 7-8pp to the Democratic side. The Democratic share of the popular vote has historically underperformed the Democratic generic ballot vote share, and there has also typically been variation between popular vote share and seats won. That said, a generic ballot advantage of 7-8pp is likely to be sufficient to win at least a slim majority of House seats, in our view. Enthusiasm gap: The ABC/Washington Post poll asks voters whether they are “certain to vote” or have already voted. Compared with the 2014 midterms the figures look good for Democrats: The share of Democrats and Democratic-leaning independents who are “certain” to vote has increased by 11pp more than Republicans and Republican-leaning independents; the non-white share has increased by 15pp more, the young share (under 39) has increased by 14pp more than the senior share, and the self-described liberal share has increased by 18pp more than the self-described conservative share. In the final CNN poll, voters who are “very enthusiastic” about voting are 8pp more Democratic leaning than those who are “less enthusiastic” about voting. 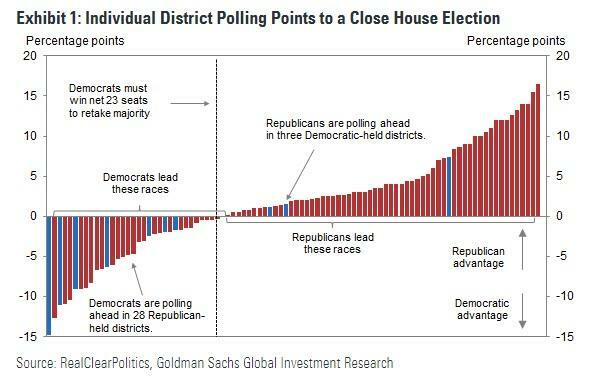 Bottom-up House polling: Polling in individual House districts shows a more competitive landscape than top-down measures. While House race polling is unreliable, the results are broadly intuitive: among seats that analysts rank as “likely” to go to one party or the other, the party leads polling in those races by around 10pp in an average of polls; among “lean” seats the average polling margin is about 5pp in the expected direction, and among “toss-up” seats the average poll is roughly tied. Taking the average of recent polls for each individual race at face value, we find that Democrats would win a net 26 seats, just a few more than the 23 they need to win the majority. As shown in Exhibit 1, the Democratic advantage in the 23rd through 26th seat averages less than 1pp, suggesting that from a bottom-up perspective the outlook for the House is fairly uncertain. Bottom-up Senate polling: Taken at face value, polling in the Senate implies both parties will emerge from Tuesday’s election with the same number of seats they have now (51 Republicans, 49 Democrats). In light of the large polling deficit Democrats face in North Dakota, the most plausible path to a majority would be to hold all other seats and win Arizona and Nevada plus either Tennessee or Texas. 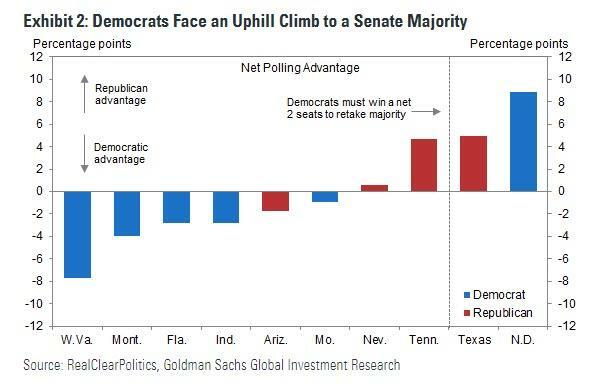 This suggests the marginal seat the Democrats would need to win the Senate majority is leaning around 5pp in the Republican direction at the moment. Prediction markets: The odds on one widely followed platform, PredictIt, imply a 65% chance of a Democratic House majority but only a 16% chance of a Democratic majority in the Senate. These probabilities are roughly in line, we believe, with the consensus view among market participants. Taxes: We expect no major tax legislation under a divided Congress scenario. However, with no major policies due to expire in 2019 or 2020, this would have little effect on our baseline fiscal policy view that tax policy goes from growth-positive to growth-neutral by late 2019. It is likely in this scenario that the Democratic House would try to pass tax legislation that redistributes the 2017 tax cut toward lower income households while also reversing the limitation on the state and local tax deduction. However, it would be very unlikely to attain the 60 votes needed in the Senate in this scenario, if it even came up for a vote. Spending: Under a divided Congress, we would expect Congress to approve discretionary caps for defense and non-defense spending for FY2020 and FY2021 that are roughly flat in real terms with the spending caps for 2019 that Congress approved earlier this year. This is the assumption underlying our fiscal projections. Infrastructure: We expect that a major infrastructure program such as the President has proposed would be unlikely under any election scenario, though some funding could be diverted toward infrastructure out of other non-defense spending, as it was this year. While President Trump and congressional Democrats have both supported infrastructure programs, the details differ substantially and, more importantly, Democrats might not be motivated to reach an agreement with the White House prior to the 2020 presidential election. Trade Policy: A Democratic House would be more likely than a Republican House to block the implementing legislation for the US-Mexico-Canada Agreement (USMCA), but we expect that the deal would eventually be approved. However, potential opposition could prompt President Trump to initiate the withdrawal process from the current NAFTA, forcing the House to choose between the new deal or none at all. In the absence of a legislative agenda in this environment, the White House would be more likely to pursue additional tariffs on imports from China, in our view (implementation of further tariffs by early 2019 is our base case). Regulatory: Control of the House would have little direct impact on the regulatory agenda, since (1) it would likely be blocked in the Senate and (2) most regulatory changes under the Trump Administration have been carried out with existing authority and have not needed congressional approval. That said, it is likely that regulatory scrutiny of some regulated industries (health care, financial services) could increase through House committees. Fiscal deadlines: Fiscal deadlines become riskier under a divided Congress. The next spending deadline is December 7, 2018 (before election results take effect) but this is likely to be pushed to either Q1 2019 or September 30, depending on what Congress decides after the election. Under a divided Congress, there will be a substantial risk of shutdown at the next spending deadline in 2019, though whether it happens will depend on the political environment at that point. The debt limit will be reinstated March 1, 2019 and we expect Congress will need to raise it by August. We note that the two most disruptive debt limit debates in recent memory, in 2011 and 2013, both occurred in a divided Congress. Taxes: If Republicans keep control of both chambers, we would expect another tax cut in the range of $60-70bn (0.3% of GDP) as a base case, though the size would depend on the size of Republican majorities in the House and Senate (larger majorities, particularly in the Senate, would likely make room for slightly larger tax cuts). Such legislation could pass via the reconciliation process with only 51 votes in the Senate, bypassing Democratic opposition. Spending: Under a Republican Congress, the spending caps for FY2020 and FY2021 might be raised to a lower amount than under a divided or Democratic Congress, but we would not expect spending to be cut by the 5% the President has proposed, which would work out to around $65bn (0.3% of GDP). In this scenario, we would expect small nominal cuts of $15-30bn (0.1% of GDP) off of the FY2019 cap level. Infrastructure: Compared to a divided or Democratic Congress, infrastructure would likely receive less legislative attention. Trade Policy: USMCA passage would likely be easier in this scenario than under a divided Congress. The probability of a de-escalation of US-China trade tensions might also rise in this scenario, as the White House becomes more focused on the legislative agenda, such as passage of tax cuts, which would require the support of Republican members of Congress, including those who are concerned about the effect of retaliatory tariffs on US agriculture, among other industries. Regulatory: The regulatory tone might be more industry-friendly under this scenario than in others, though the odds of enactment of any major deregulatory initiatives under this scenario would be low, in our view, as it would be unlikely to attain the 60 votes necessary to pass the Senate. Fiscal deadlines: The spending and debt limit deadlines in 2019 would be somewhat less eventful under an all-Republican scenario, in our view. That said, growing deficits (we project a $1 trillion deficit in FY2019) and the need to secure bipartisan support for any spending extension might nevertheless make next year’s deadlines somewhat more eventful than they were over the last two years. Taxes: Using the budget reconciliation process, Democrats could pass legislation reversing some of last year’s tax cuts. President Trump would likely veto but the process could increase uncertainty, particularly regarding the medium-term fate of the tax cuts after the 2020 presidential election. Healthcare: President Trump and congressional Democrats have used similar rhetoric regarding drug pricing, but so far the Administration has not made substantial policy changes (though it has proposed some). Using the budget reconciliation process, a Democratic Congress would likely send legislation to the President’s desk that reduces spending on pharmaceutical and biotech products. Infrastructure: An infrastructure package would become at least slightly more likely under a Democratic sweep than a divided Congress, but we would not expect a major package to be enacted. Trade policy: The outlook would be similar to a divided Congress. A Democratic Senate would present less of a hurdle for passage of the USMCA than a Democratic House. Control of the Senate seems unlikely to alter the Administration’s stance on US-China trade. Regulatory: Since 60 votes are necessary in the Senate for any regulatory legislation, a Democratic majority would not be sufficient for passage. That said, the Senate is responsible for confirming nominees for regulatory agencies, so replacing departing agency heads could become more difficult. Fiscal deadlines: A Democratic Congress would likely have nearly as much difficulty agreeing on spending legislation or raising the debt limit as a divided Congress, in our view.